There’s a knock on my bedroom door. I roll myself out of bed, head first, completely out of it because I had only just arrived there 30 minutes prior. I convince myself to move one foot in front of the other, as I sleepily go answer the door. “My stomach hurts. I don’t feel good. Mommy, please.” She stammers. We walk to the bathroom, I hand her some Pepto-Bismol, and as I turn around to do whatever it is that sleepy people do, I hear. . . .
“Uh-oh. I don’t think that was a good idea. I feel WUUURRRSSSS!” And then, POW. Up chuck all over the bathroom floor. The really chunky kind. Foul smelling. Rank. Putrid. About 2 gallons of it. On my bathroom floor. At 12:30 am. With no maid insight. Only me, and a sleeping Dad. Who is, quite frankly, only pretending to sleep to get out of cleaning this mess. I look at that poor kid, as she sits on the side of the bathtub, blue-ish face, languid expression, lethargic movements, and I think, Jackpot. Today is the day, she turns back into my baby. Today is the day, I get to be her mommy, like the good old days. Today she’ll let me hold her. Today she’ll cuddle up to me, be as sweet as pie, and realize that there is no love but a mommy’s (or daddy’s) love when your sick. TODAY I WILL REJOICE FOR THIS GIFT OF A NON ARGUMENTATIVE, LOVING CHILD. The truth of the matter is, I’m just looking on the bright side. Of course, I don’t WANT her to be sick, but, if she is going to be sick anyway, I can definitely see how one might enjoy the situation. And cleaning puke off the bathroom floor, is a small price to pay for it. So I cleaned the guk! off the bathroom floor, laid her gently down on my wipeable gigantic LEATHER-ISH recliner with a blue up-chuck container, and loved her all night long as she re-created that scene for me every 40 minutes. By 5 o’clock the worse had passed, so she went to bed upstairs. I cleaned her room, changed her linens, and I made her homemade soup. The entire day was filled with thank-you nuzzles and sad little “I’m not feeling well” smiles. Not once did she yell at her sisters, and I was quite literally the happiest mom alive. Every family has there own cure for stomach aches. I’ve heard of the BRAT diet. It stands for Bananas, Rice, Applesauce, and Toast. I think. I’m really not sure. Clearly we don’t subscribe to that diet. What seems to work for us are two things. 1.) Hot Peppermint Tea. It’s a bit granola, but it works for any upset stomach imaginable. The toots? Got it covered. Stopped up? Not a problem. A little runny? This will slow you down. Feeling Queasy? This will go down nice ‘n easy. Okay, gonna stop now. But just so you know, my kids pretend to have belly aches to insure a dose of Hot Peppermint Tea. I add a bit of sugar, and the stomach ache ALWAYS disappears. If your giving it for the toots, and the gas is pretty bad, it may take a few of cups of tea to push it all out. Sorry. There was no easy way to say that. 2.) Good Old Fashioned Garlic Soup, with noodles of course. The soup is made from chicken broth, which helps alleviate dehydration, congestion and acts as an anti-inflammatory. The garlic helps fight off the illness with its antibacterial compounds, also helping to speed up your recovery time. Additionally, garlic is seen by many as a preventative, helping others in your family steer clear of any germs that may be lurking. Finally, we add the noodles, because we love noodles. But it doesn’t hurt that they are mild in flavor, go down easily against sore throats, and stay down better than most foods. Here’s my quick and easy garlic soup. The garlic cooks for a long time, losing any strong flavors or bitterness, and the result is a mild flavored, tasty soup. So what’s your cure for a cold or an upset stomach? I’d love to know! 1. In a large pot over medium high heat, warm chicken stock. Add 1 teaspoon of salt. Bring to boil, and then lower to a simmer. 2. Break apart head of garlic, and remove skins from each clove. Cut off the hard knob at the bottom of each clove. Place all of the cloves into the simmering chicken stock. Cook for 1 – 1 1/2 hours. 3. While the soup is cooking, break spaghetti into 2 inch pieces. Cook spaghetti according to package directions. Drain, and set aside. 4. Remove garlic from soup or puree entire soup in a blender to remove chunks. At this point, the garlic will be like butter, but I generally remove it because my children like a clear broth.. Another option is to remove garlic cloves, and spread them on toast and make garlic bread. 5. 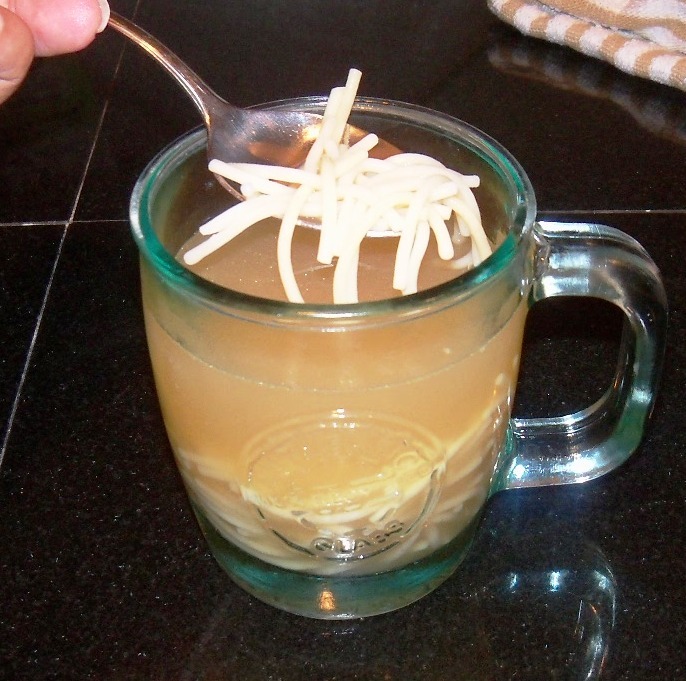 When you ready to serve, fill half of your cup with noodles, and pour broth on top*. Serve warm. 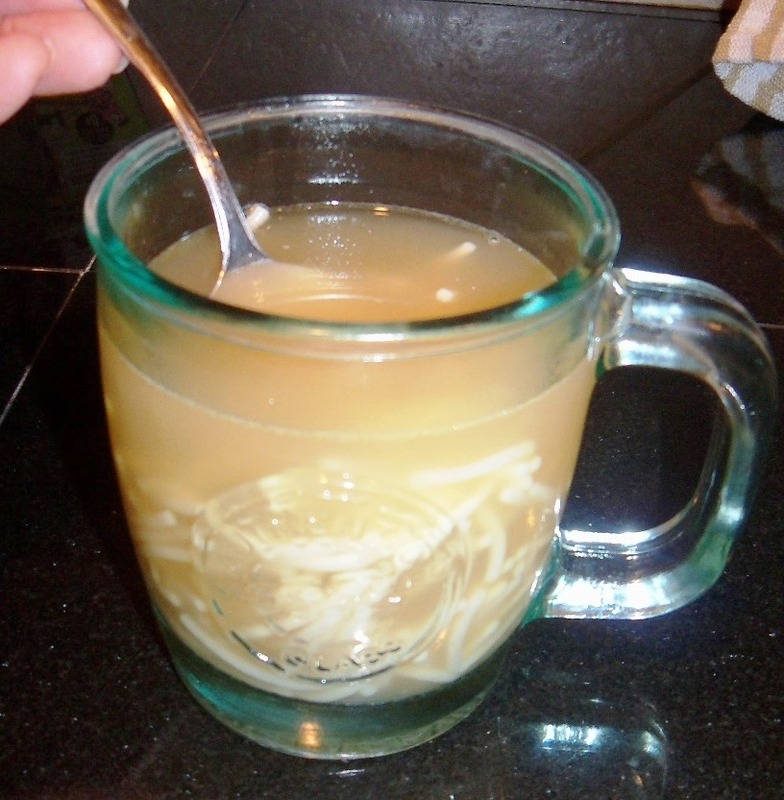 *If using regular noodles, I recommend leaving them separate from the broth until serving time. Otherwise, the noodles will continue to absorb the broth, become very soft, and start to fall apart if left to sit. If you want to add your noodles to the broth, purchase NO YOLK – Dumplings. The bag must say “Dumplings” on it. They stand up the broth and won’t fall apart like a traditional noodle will.